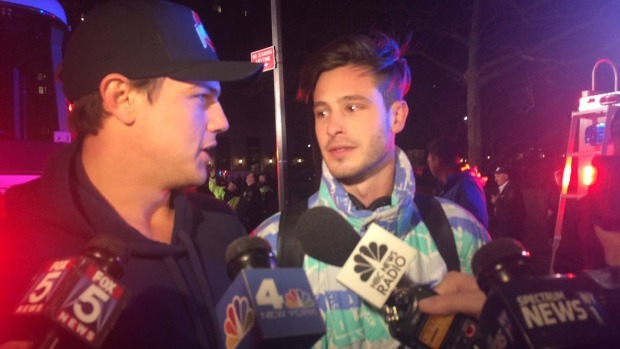 Two skateboarders helped rescue seven young people from an icy pond in Central Park on Monday night. Ray Villeda and Gus Rosendale report. Seven young people were rescued from a pond in Central Park after they suddenly plunged through the ice on an unseasonably warm February holiday in New York, authorities say. By the time FDNY arrived at the park by 59th Street and Central Park South, the kids, ranging in age from about 10 into the teens, had been pulled out of the water, according to two passersby who said they rescued the children. The good Samaritans, Bennett Jonas and Ethan Turmbull, told reporters they were skating nearby when they saw the kids dancing on top of the ice, then suddenly plunging into the water. "I look over, I saw six heads just trying to get to the shore," Jonas said. "The back one was probably a good 20 yards from dry land." Bennett Jonas and Ethan Turnbull recall how they found six young people in the water at Central Park and ran to save them. Jonas dived in as Turmbull stood by to grab them. "The last two at the end, the kid at the end was unconscious," Turmbull said. "[Jonas] got him out, he was kind of out of breath, and [Jonas] threw him to me. I just kind of minded him until he came to." Jonas said the boy had been so far out in the water he wasn't sure he would be able to get to him. Fire officials estimated the pond was as deep as 18 feet in the middle. "The only thing you could see was the back zipper of his backpack," he recalled. "I grabbed his backpack not knowing if there was a body on it." FDNY Deputy Chief John Schof said by the time firefighters showed up, seven people were coming out of the water. EMS rendered first aid, and the people were taken to local hospitals with minor injuries, mostly hypothermia-related. Divers went into the water to make sure no one else was in the pond. Schof acknowledged the "reports [that] there may have been a couple of passersby that helped some people out," but said he couldn't confirm the details because "we weren't there at that time." Still, Jonas and Turmbull spoke to reporters from a caravan of fire trucks near the scene; a visibly shivering Jonas was wearing an FDNY sweatshirt he said he was given by firefighters because his clothing was soaked. Schof says the incident is a reminder that going out on the ice is not a good idea. "When the ice is somewhat thicker, it may work because it distributes people's weight, but on this ice it was very thin, and it's not going to hold anything," Schof said. Jonas, a native of San Clemente, California, who now lives in midtown, and Turmbull, of Sydney, Australia, say they happened to be in the right place at the right time. "I was in the park for a reason tonight," he said. "I could have been anywhere right now, but I was 100 yards away, from kids who were drowning."